My rating: 9/10. 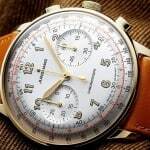 A high quality vintage inspired automatic chronograph watch. 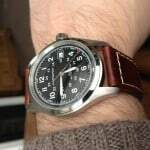 Hello, today I’m taking a look at the Hamilton H38716731. This is the Hamilton Intra-Matic 68 Autochrono, it’s a watch that’s bound to delight Hamilton collectors. The timepiece echoes the historical design of Hamilton watches with its vintage inspired style. 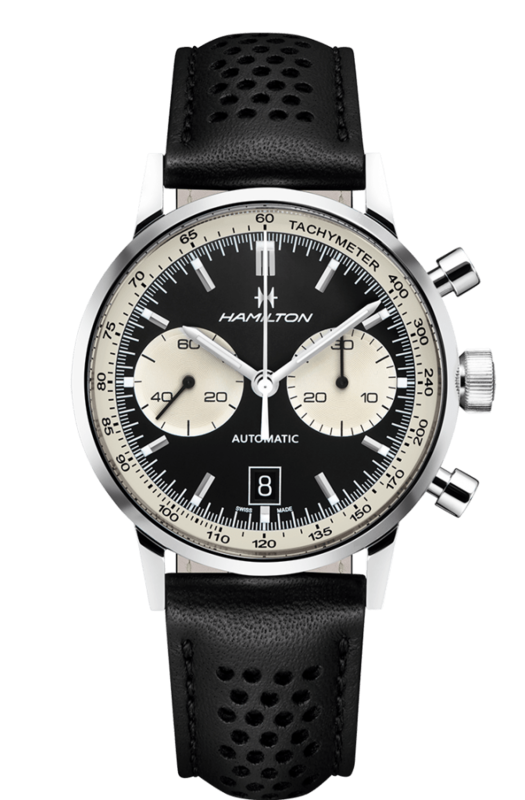 The Hamilton Intra-Matic 68 Autochrono is a limited edition watch with just 1968 pieces produced. They started production in 2017 as part of the Timeless Classic collection. I hope you enjoy today’s Hamilton H38716731 review. You can check out more of the top Hamilton watches here. 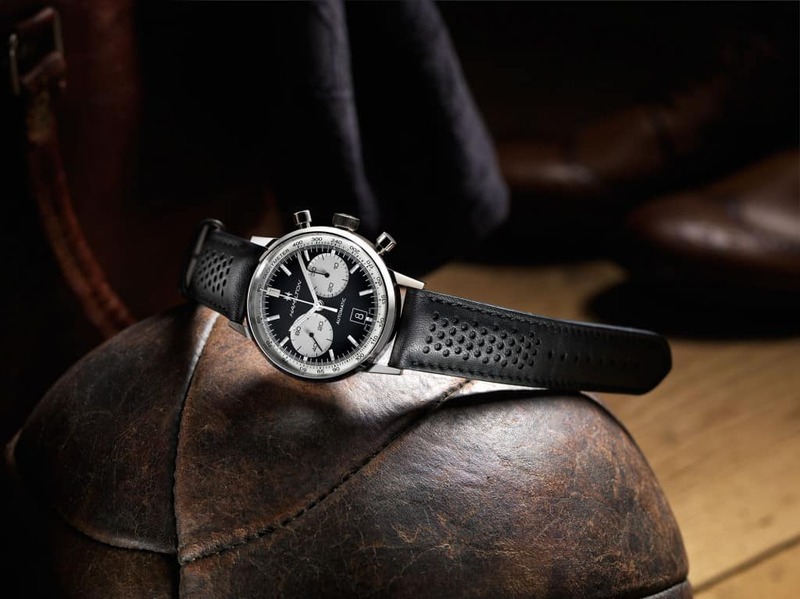 Below is an image of the Hamilton H38716731 featuring a genuine leather perforated strap. I wanted to get things started with a quick overview of some of the more popular techincal specifications that people look at before making a decision on a watch. This gives you the opportunity to see if you like this style of watch from the get-go. For example, some people wouldn’t want to go for a very large watch. The Hamilton Intramatic 68 is a stunning limited edition timepiece that’s perfect for anyone seeking that classic vintage chronograph style but want the benefits of modern day materials and movements. It’s a little hard to see from the pictures but this Hamilton watch features a beautiful curved dial design with a black background and off white coloured subdials and chapter ring, this is a nod to the chronographs of the 1960s. There’s also a date indicator at the 6 o’clock position on the dial. The hands have a curved design to go with the curved finish of the dial. A Super-LumiNova coating on the hands and tips of the hour markers make this watch much easier to read in dim lit conditions. The casing of this timepiece is made of stainless steel with a solid back. It has a diameter of 42mm with a thickness of 15mm. The crown is located at the 3 o’clock position along with two vintage-feel pushed either side. The Hamilton Intra-matic 68 features a perforated genuine leather strap to add to that vintage style design. This comfortable leather strap has a width of 22mm. This can be changed to an alternative strap if you wish to do so, the gap between the lugs is 22mm. Purchase a watch repair kit for all the tools required for this job. At the heart of this Hamilton men’s watch is a Swiss made H-31 caliber automatic movement. 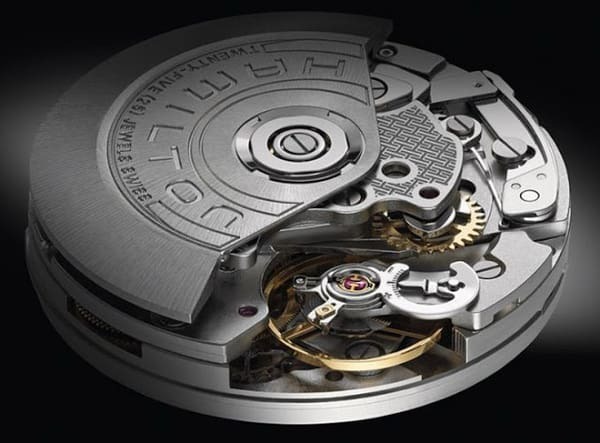 This movement is based on the Valjoux 7753 and 7750 movement. It features an increased power reserve of 60 hours when fully wound. The H-31 features a 27 jewel design and beats at a frequency of 28,800 BPH. This gives you a really smooth sweeping second hand at 8 ticks per second. You’ll also spot the H-31 in other Hamilton chronograph watches such as the Pan Europ watch. Protecting the front of this impressive Hamilton timepiece is a domed sapphire crystal glass lens. The has a Mohs hardness rating 9 giving you a very high level of scratch and knock resistance. The domed finish to the glass lens add to the vintage style of the Hamilton Intra-matic 68 autochrono. 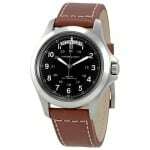 The water resistance rating of the Hamilton H38716731 is 100m, also known as 10 bar. As per Wikipedia, this is suitable for recreational surfing, swimming, snorkeling, sailing and water sports. Note that this is not suitable for diving. I wanted to point out some of the pros and cons of this Hamilton Intra-matic 68 and display them in a nice and easy to read format so you can see if this watch is right for you. The Hamilton H38716731 is a beautiful looking vintage inspired watch with a very high quality Swiss made automatic movement. I love the look of the reverse panda dial making the chronograph sub-dials very easy to read at a glance. I’m also thoroughly impressed with the H-31 automatic movement at the heart of this watch. A 60 hour power reserve and a 28,800 BPH is something that most people will be pretty happy with. I love the look of the sweeping second hands you get with the 8 ticks per second. It’s a bit of a shame about the lack of a stainless steel strap version as I know quite a few people would have loved that. Also there seems to be a bit of dislike towards the larger casing design, though, personally I’m not so fussed about this. I hope you enjoyed having a read through of this Hamilton H38716731 review. As always let us know what you thought in the comments section below.